Envision being at your place of work when someone approaches the front door holding a gun. Perhaps it’s an armed robbery attempt, or even a disgruntled former co-worker approaching the building. Now imagine that your company’s surveillance system is able to recognize this threat within seconds, automatically lock the doors, contact the authorities, and initiate an emergency action plan. This is what Defendry is bringing to market. No one thinks this will happen to them, at their business, to their employees and customers. But it happens every day. The data shows us that over the last 20 years, the incidence of violent intrusions in the US have skyrocketed. According to the FBI, who defines an “active shooter” as “an individual actively engaged in killing or attempting to kill people in a populated area,” there was only 1 active shooter incident in 2000, which resulted in 7 casualties. 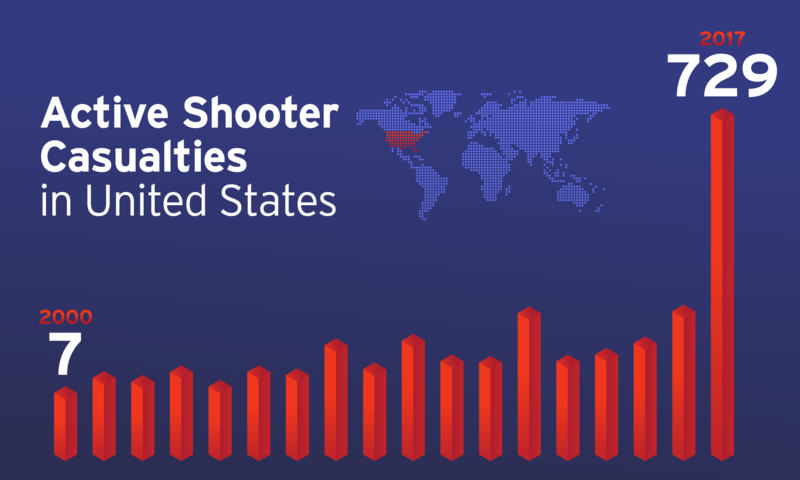 This number catapulted to 30 active shooter incidents in 2017, claiming 729 casualties. There have also been more than 30,000 reported commercial robberies each year, many involving weapons, with that number realistically estimated to be much higher. To break things down even further, in the U.S. in 2016 there was said to be 1 burglary occurring every 40 seconds. These numbers are intimidating and sobering. It’s alarming to imagine the vulnerability and lack of control that victims experience in these situations. Even the most quick-witted and level-headed person is prone to panic and delayed response when faced with this type of stress-inducing incident. This is exactly where the power of advanced technology can come into play, in order to help stop these events before they result in tragedy. Defendry is a next generation, 24/7, active surveillance platform for businesses of all types. With proprietary artificial intelligence and Active Response Technology™ (a.k.a. “ART”), Defendry helps prevent intrusions and active shooter situations. With this type of heightened surveillance in place, companies that use Defendry can potentially save millions of dollars by minimizing financial losses due to intrusions, and gain a sense of ease knowing that the lives of their employees and customers are being protected. Created by serial-tech entrepreneur Pat Sullivan, Defendry is now one of three brands within his tech company, Contatta. Defendry includes components of Contatta’s other products’ group chat and task management platform in Ryver along with the IoT operations manager in IoTalk. The idea for Defendry came to Sullivan during a flash of insight while talking to another CEO about AI technology. According to Deep Science CEO and Founder Sean Huver, Sullivan reached out to him once he realized the immense potential of combining their subsequent efforts. “We wanted to join forces with Defendry because we thought we had a better opportunity to capture a larger part of the market working with someone like Pat who has a lot of experience,” says Huver. This acquisition not only provides key elements of the visual spectrum technology (to identify masks and guns, for instance), but also has the potential for recognizing verbal and auditory threats in the future. To help in getting this project off the ground, Defendry secured funding from Avnet, a global leader of technology solutions, including electronic components and services. “State-of-the-art” monitoring is a farce. Most businesses have a few cameras that are checked by humans for less than one minute per day. In the event of a break in or active shooter incident, by the time the authorities are notified and police arrive, lives are lost and liabilities are racked up. Even in environments where security guards and a multitude of cameras are enabled, it’s simply impossible for human surveillance monitoring to watch every camera all the time. Safety and liability threats aren’t reported for minutes to hours, costing lives and potentially millions of dollars. Economically speaking, employing a 24/7 security team would cost a company potentially millions of dollars each year. Defendry’s ART can work more consistently and effectively than a team of humans, monitoring 24/7 without breaks, and for a fraction of the price. Defendry’s technology removes the element of human emotion and the burden of acting precisely in a life-threatening situation, enabling a significantly faster and more consistent response to emergency triggers. 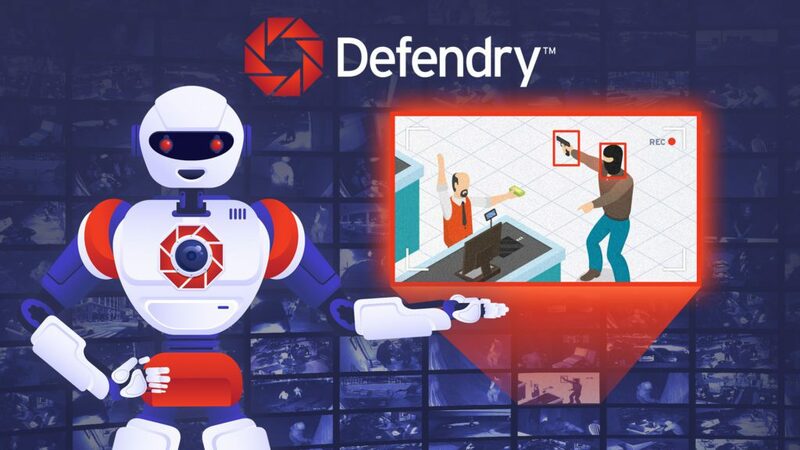 “The vision for Defendry is to be the leading security company using AI for 24/7 surveillance, combined with our enterprise-grade workflow and collaboration platform to actively respond to and help prevent security threats of all kinds. From active shooters to slip-and-fall incidents, businesses, retailers, schools, and places of worship will be able to protect their people and assets in a way not possible before now,” said CEO, Pat Sullivan.